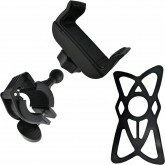 EKLIPES™ EK1-165 Co-Pilot Cell Phone Handlebar Mount easily and securely mounts your device onto any common size handlebars (7/8 Inch, 1 Inch, and 1 ¼ Inch). Perfect for use on either bicycle or motorcycle and is universal for other power sport vehicles like ATVs. The silicone net will stretch up to 10 times its own length, to tightly grip even some of the biggest phones! EKLIPES™ Co-Pilot will fit any phone and case up to 3 ¼ Inches wide. (Does not fit all phones combines with cases, so be sure to measure combined width before purchasing) Fits these Popular Models: iPhone 6 + | 6s + | 6 | 6s | 5 | 5s | 4 | 4s | Google Nexus 6P | 5X | Samsung Galaxy S7 Edge | S7 | S6 Edge | S6 |..
• Securely fits any phone up to 3 ¼ Inches x 7 Inches • Durable Flex ball joint allows 360° rotation and flexibility • Designed with Quick-fasten technology for easy on-the-fly mounting and removal • Easily mounts directly onto all common air vent styles with secure rubber grip EK1-168 Co-Pilot Cell Phone Vent Mount easily and securely mounts your device onto any common Car / Truck / SUV air vents. 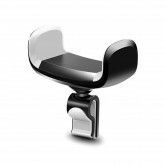 Perfect for hands-free driving and is universal for all vehicles and most smart phones. EKLIPES™ Co-Pilot will fit any phone and case up to 3 ¼ Inches wide. (Does not fit all phones combines with cases, so be sure to measure combined width before purchas..
Our New EK1-161 EKLIPES™ Chrome Viper Solid Steel Adjustable Dual Ring Handle Bar Mount is perfect for mounting our EKLIPES™ Chrome Viper Power Socket (EK1-109) and EKLIPES™ Black Viper Power Socket (EK1-108) directly onto your Motorcycle Handle Bars. This Mount is the first of its kind with an Adjustable Dual Ring Easy Handle Bar Mounting system for a perfect, easy fit on ALL 7/8 Inch, 1 Inch, and 1 ¼ Inch Handle Bars as seen in the Picture above. 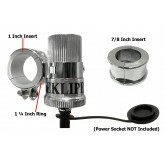 This Dual Ring Mount has a 1 Inch diameter Adjustable Ring on one side that fits all Industry-standard 1 Inch 12 Volt Power Sockets, and a 1 ¼ Inch diameter Adjustable Ring on the other side and includes 1 Inch and 7/8 Inch Adjustable Insert Rings to give you a perfect fit no matter what size Handle Bars yo..
Our New EK1-161B EKLIPES™ Black Viper Solid Steel Adjustable Dual Ring Handle Bar Mount is perfect for mounting our EKLIPES™ Black Viper Power Socket (EK1-108) and Chrome Viper Power Socket (EK1-109) directly onto your Motorcycle Handle Bars. This Mount is the first of its kind with an Adjustable Dual Ring Easy Handle Bar Mounting system for a perfect, easy fit on ALL 7/8 Inch, 1 Inch, and 1 ¼ Inch Handle Bars as seen in the Picture above. 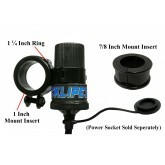 This Dual Ring Mount has a 1 Inch diameter adjustable ring on one side that fits all Industry-standard 1 Inch 12 Volt Power Sockets, and a 1 ¼ Inch diameter adjustable ring on the other side and includes 1 Inch and 7/8 Inch adjustable inserts to give you a perfect fit no matter what size Handle Bars you have! ..